How do you store flammable liquids compliantly? The flammability of a chemical is determined by the flash point. Many chemicals have different flash points so understanding the hazards associated with each chemical is critical. Flammable and combustible liquids can ignite readily and burn rapidly, therefore full compliance is necessary for keeping facilities and personnel safe and secure. Chemicals give off vapors, which cause the initial fire or explosion. There is a positive correlation between the vaporization rate increasing and temperature increasing, therefore flammables and combustibles are increasingly more dangerous and volatile as temperatures increase. Flammable chemical storage units by US Chemical Storage keep flammable chemicals and non-flammable chemicals fully compliant. Flammables and combustibles have very strict storage requirements, therefore compliant storage solutions are necessary and required. Fire-rated storage units are designed for storing flammables, combustibles and other hazardous chemicals that require a fire rating for 100% compliance. Fire-rated chemical storage units by US Chemical Storage offer superior protection and security. Choose between our 2-hour fire-rated chemical storage unit and our 4-hour fire-rated chemical storage unit for maximum protection and efficiency. Store your chemicals closer to your occupied facility with a flammable chemical storage unit by US Chemical Storage. Meets EPA, OSHA, NFPA and FM approvals or Warnock Hersey standards. Keep safe – stay protected. Designed for storing flammable chemicals at least 30 feet away from occupied facilities or property lines. 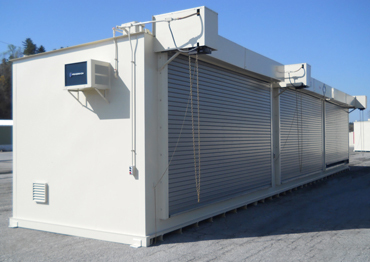 All chemical storage buildings are 100% customizable and 100% compliant. Features a built-in secondary containment sump for containing hazardous chemicals in the event of an accident. When fire-ratings are not necessary for storing hazardous materials compliantly, non-fire rated chemical storage units by US Chemical Storage are ideal. Customize your non-fire rated chemical storage unit with our wide variety of chemical storage accessories. Including, but not limited to flooring, ramps, lighting, mechanical ventilation, doors, alarms, sensors, heating systems, cooling systems, temperature controls and more. Contact US Chemical Storage for more information on how to keep your chemical storage fully compliant. Flammable chemical storage units provide safe, secure and compliant protection for personnel, investments and facilities. NFPA hazard classifications are illustrated below.